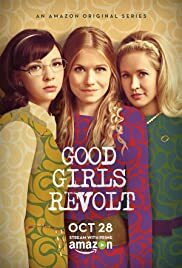 Based on the true story, Good Girls Revolt follows the lives of women working in fictional "News of the Week" newsroom (based on Newsweek magazine) as "researchers" under a group of male reporters. The story focuses on the lead up to their battle for equal rights in the workplace, notably their right to be reporters. Happenstance led me to this series and I, as well as my husband, totally taken with it. Having lived the 60's in Manhattan, I can really relate to this. So disappointed the series was not renewed. Hoping this will change. Can't wait to introduce my daughter to the series (she lived Manhattan in the late 90's). Great series, excellent performances!